(Special Order item) Please call for further details. You may use the battery listed below for the same application. 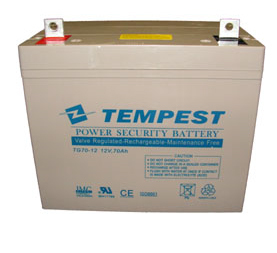 12 volt, 70 Ah gel electrolyte battery for general purposes. Length 10.24", Width 6.65", Height 8.31" (Total Height 9.17"), F3 terminals (Terminal hardware included), Approx Weight 62 lbs. 10-12 Year Service Life Under Float Service @77°F / 2 Year Warranty.